Ali Hassan Joho to be Blocked from contesting in the August polls due to his 'fake' academic papers. - Bana Kenya News, Real African Network Tubanane. 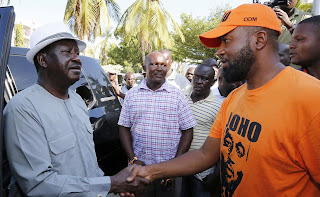 Home featured Mombasa Ali Hassan Joho to be Blocked from contesting in the August polls due to his 'fake' academic papers. Ali Hassan Joho to be Blocked from contesting in the August polls due to his 'fake' academic papers. The Mombasa governor will be locked out of polls due to alleged holding 'fake' academic papers. The KNEC confirmed that Ali Hassan Joho did not complete secondary school education at Serani in 1992. The Registration numbers on his certificates do not match with their Codes in the 1992 students who sat for secondary school exams. According to the County government records, Ali Hassan Joho finished Serani secondary in 1993. The documents given by the Principal at Serani boys secondary school shows that the Governor completed in 1993 and urged the Ministry to look afresh their details. The governor said that it is because of his opponents eyeing for the seat and the battle between him and the president. The Mombasa governor has been in difficult situations following frozen accounts by the government for allegations that he flaunted Revenue laws since 2011. The other fracas is about his degree that the government said that it is not genuine. The degree drama started all the way from 2013 and up to date the drama is still on.